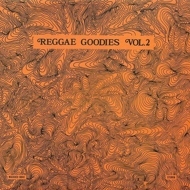 Both volumes of Reggae Goodies came out around 1977 on Bullwackies' City Line imprint (which celebrated the NY subway track ending at White Plains Road, and Wackies' headquarters). They are based on a compilation of 7" A-sides which had appeared over the previous few years also on labels like Versatile, Rawse and Senrab. Volume 2 derives more from Wackies' Sounds Unlimited Studios in New York, and aims rather for the Lovers in the dance. Ad hoc lineups like Wanachi (with Jah Jah's Call also appearing on Creation Dub) and the Chosen Brothers - here it may be Lloyd Barnes with Wayne Jarrett on one track, and Leroy Sibbles on another - appear alongside regulars like 'Jah Junior' Delahaye, K.C. White, and those 'three attractive young beauties' The Love Joys - with a different mix of their version of The Abyssinians' Sweet Feelings than turns up on their debut album.